Rare All-Marshmallow Boxes of Lucky Charms Are Back. Here's How to Get Them. Lucky Charms are arguably one of the best sugary breakfast cereals of your childhood/late night cereal snacking. The marshmallows, of course, are the stars of the show. They’re sweet, crunchy (at least at first), and generally superior to the actual cereal bits. That’s probably why Lucky Charms first introduced marshmallow-only boxes of the beloved breakfast to acclaim, and why they’re back once again. The all-marshmallow “cereal” of your adolescent dream is officially back as of Monday, but you won’t be able to get your hands on boxes of it in the grocery store. Instead, Lucky Charms is giving away 15,000 limited-edition boxes of rainbow and unicorn marshmallows to winners across the United States, according to a spokesperson. There are a few things you have to do to win. First, keep your eyes peeled for specially-marked boxes of Lucky Charms at retail stores. Then just enter the code on the inside panel of the box at MarshmallowOnly.com to find out if you’ve won. While it’s slightly involved, it’s significantly easier than searching for a pot of gold at the end of a rainbow or something, right? Winners will be shipped a box of Lucky Charms Marshmallow Only to their door. 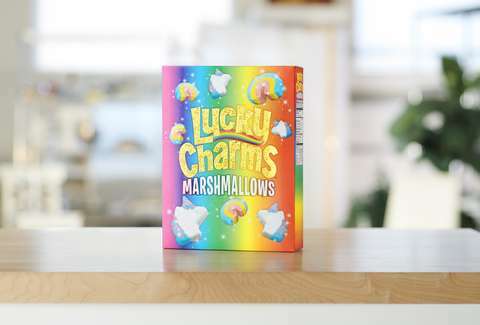 If you’re one of the recipients of the limited edition boxes of Lucky Charms Marshmallow Only, you’ll also be enrolled in the Lucky Charms Marshmallow Only Club. It’s not totally clear what benefits membership into this exclusive secret cereal society have, but if Lucky Charms marshmallows are involved, we’re in. In 2017, General Mills ran a similar promotion, but only 10,000 boxes of Lucky Charms Marshmallow Only were available. The following year, Lucky Charms added a new whimsical marshmallow shape to its longtime marshmallow lineup. The company said it came up with the decision with the help of “the imagination and creativity of young minds.” The unicorn, which takes center stage alongside the rainbow marshmallow in the marshmallow-only boxes of Lucky Charms, bumped the hourglass marshmallow out of the box for good. If you don’t win, you can just pick up a box of Lucky Charms and separate the marshmallows from the cereal bits. Admit it, you were going to anyway. You could also snag one of these knock off all-marshmallow cereals, on Amazon, though we can’t promise it’ll taste the same.